Many studies have demonstrated that individuals who engage in running exercises appear to develop musculo-skeletal injuries more frequently . Considering the foot, the most common injuries include stress fractures of the metatarsals, plantar fasciitis, tibialis posterior lesions and ankle sprains. Studies have been conducted who analysed the loading characteristics of the foot in repeated measurement designs – before and after exercise – in order to find a pathomechanical pathway for metatarsal stress fractures [2–4]. The published studies evaluated the in-shoe plantar pressure during treadmill running [2, 3] or barefoot after a marathon . To date, no investigation have been conducted who evaluated the impact of a regular training session onto the forefoot loading characteristics. The objective of this investigation was therefore to identify changes in loading characteristics of the foot after a 90 minute running exercise. Thirty-two volunteer athletes (4 women, 28 men) were recruited to participate in this study and gave their informed consent. During the pre-training session, participants were asked to run barefoot at a self-selected speed across a plantar pressure platform (RSscan International, 0,5 m × 0,4 m, 4 sensors/cm2, 300 Hz) that was embedded in a 16 meter walkway (EVA foam, shore 60). The post-training measurements were performed in the same location and according to the same method. Three left and three right steps were captured for each session and each participant. One observer localised 6 anatomical regions on the footprints using the multimask function of the software (Scientific version 7.0). 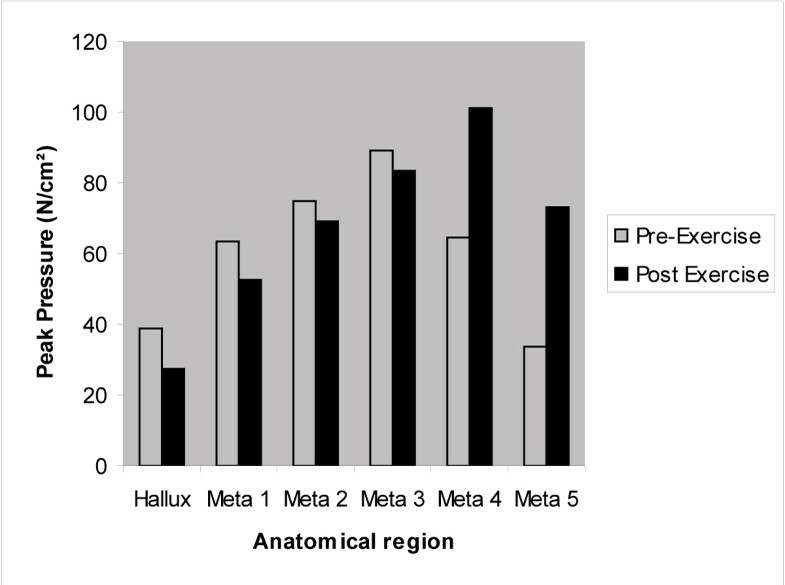 For these regions (the five metatarsal heads and the hallux) the following dependent variables were analyzed: Peak Pressure, Impulse, Time to Peak, Start Time and End Time. Intra-individual differences between both conditions were tested for significance with the paired student T-test. The contact time of the whole foot was not significantly different between the pre-and post training sessions, which indicates repeatable gait. Also, no significant differences were found between the various parameters of the two sessions, and this for all the 6 regions under investigation. However, in some participants a clear different Peak Pressure pattern (Figure 1), was found in the pre-and post exercise situation. Changes in Peak Pressure between pre-and post-exercise in one patient. The results of this study show no significant changes in the loading characteristics as reported by other publications.